This week we looked at a concept called ferromagnetism which allows us to demonstrate the 3-dimensional nature of magnetic fields. Since this science course was first examined in 2006 graph questions have become quite common. There are different types of graph questions, and we will look at each of these different types in turn. There is nothing scary here, and you have probably covered them all in maths anyway. It’s just that the science textbooks don’t seem to do a very good job of telling us why we have them in the first place, or why there are different types. Why do we have graphs? You won’t get asked this so you don’t have to learn it off by heart – I just thought you deserved to know. There are many different reasons, but we’ll just look at two here. To see what the relationship is between two variables, e.g. between the extension of a string and the force which caused it. Now assuming that a bigger force causes a bigger extension, the question is; are the two quantities directly proportional? i.e. if the size of the force doubles then the extension should be twice as much, if the force triples the extension will be three times as much etc. 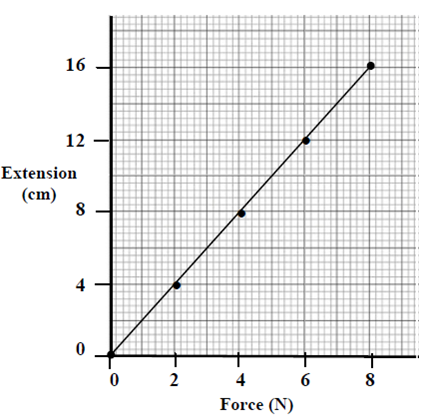 Another way of saying this is that the two quantities increase at the same rate (as force is increased the extension increases at the same rate). Or finally the scientific way of saying this is to say that the two quantities are directly proportional to each other (you must learn the phrase in italics off by heart because it gets asked a lot as you will see below). To investigate this you would plot the results on a graph, and if the two quantities are directly proportional then you will find that if you draw a line through the points you will end up with a straight line through the origin (the origin is the (0,0) mark). In some graphs the slope of the line gives us some extra information (and you must know what this is). There are only three graphs which fall into this category so make sure that you know each of them. 3. The slope of a voltage-current graph corresponds to the resistance of the resistor under investigation. Note that for each of these graphs you will also get a straight line going through the origin, which verifies that the two quantities are directly proportional to each other. Which brings us to our next problem – how do we calculate the slope of a line? Pick any two points (from the graph) and label one point (x1y1) and the second point (x2y2). Make life easy for yourself by picking (0,0) as one of the points (assuming the line goes through the origin). Yo – Which axis is the y-axis? Usually there is at least one graph to draw on the Junior Cert Science paper, and if it’s in the Physics section then chances are it will be a straight line graph (the main exception is Cooling Curves). There’s nothing on the syllabus (that I’m aware of) that states that students are expected to know the significance of a straight line graph. In fact here’s a piece of research for you – next time you’re in class ask your students why we’re expected to bother with graphs in the first place. My bet is that very few will be able to give a convincing answer. One reason we ‘bother’ with graphs is to establish a relationship between two variables; to use the correct jargon we want to see if the variables are ‘directly proportional’ to each other. Now that term ‘directly proportional’ is very important. In means in effect that the two variables are increasing at the same rate. For example if you are on a bicycle travelling at a steady speed of 10 m/s, then for every second that you cycle you will have travelled 10 m (d’oh), and if you travel for twice as long you will cover twice as much ground. If you travel for four and a half times as long, you will cover four and a half times the distance. So again, the time and the distance covered are increasing at the same rate – they are directly proportional to each other. The graph is our way of verifying this – it turns out that when you plot all the given data and you end up with a straight line which passes through (0,0) then we can state that the two variables are directly proportional to each other. So why am I telling you all this now? Because in the exam you may be asked to draw a graph and then say what the relationship is between the two variables. And if you don’t use the phrase ‘directly proportional’ in your answer then you probably won’t get full marks. Now as I mentioned I have never seen this phrase highlighted in a Junior Cert textbook so you may well have heard it here first. Now to help you I have compiled all the graph questions that have ever been asked at Junior Cert into one word document. You can find it on the revision page of thephysicsteacher here (it’s no.3 – Graphs). It also contains all the solutions to the questions, plus a list of do’s and don’ts. Make sure you check it out before going into the exam. And if you’re reading this as a teacher please remember when photocopying to copy back-to-back and reduce two pages onto one. In doing so you reduce the amount of pages by a factor of 4.
boards.ie seems to win awards every year for its site. For me it merely highlights the fact that everybody seems to be communicating with each other except teachers – sure what would we have to talk about? Well here’s an interesting nugget – from the comments below (pasted from the relevant boards.ie pages) it would appear that quite a few teachers are not sure what they are supposed to do with their students’ experiment copies, or how to fill in the green investigation booklets. Remember that if the students don’t tick the relevant experiments in their green booklets then they automatically forfeit 10%. ok everyone, don’t forget your hardbacks tomorrow! Dunno what he is on about, you don’t get marked on your hardback. Maybe he means just for study purposes? Think he means your experiment copy?? I think! Exactly. DO NOT forget it. If they go to check yours, and you’ve ticked the boxes to say you’ve done it, and its not there, they count that as cheating. nah you’re not supposed to take it in with you afaik…the supervisors would have reminded us anyways…. They inspect a small % of schools and the hbacks are sposed to be with your science teacher. Our teacher collected ours at the end of April, she said there was a deadline I had to do about 15 experiments in the space of 3 days! But the inspectors only come in the summer! I’ve had to write up a good few today, but that was my own lazy selfs fault.. I aint bringing mine in that’d be effort and no one told us to we were given them back and told it was fine? I know I’m probably not alone on this front. For the green lab books did we have to tick something or do we just do the experiments and hand it up?…..i already have it handed up but didnt tick anything..? ?